“It is a much more complicated process with two, three or four parties involved. There are two truck components on top of rail,” said David Menzel, president and chief operating officer for Echo Global Logistics. He spoke on a panel during the Intermodal Association of North America’s Intermodal Expo 2018 here. The Chicago-based firm has invested in technology to track visibility so customers always know where their shipment is located. Echo Global Logistics ranks No. 40 on the Transport Topics Top 50 list of the largest logistics companies in North America. Evan Armstrong, president of Armstrong & Associates, said on the freight brokerage side, there are thousands of brokers to choose from. “That isn’t the case on the intermodal side. There are only so many Class I railroads, and their on-time performance directly impacts what your customers expect in terms of service,” he said. “So many exceptions can happen, and you have to have a good relationship with all parties involved,” Armstrong said. The use of freight brokers varies by the size of the shipper, Armstrong explained. “The larger the customer, the more likely they are to contract 70% to 80% of their freight needs and use freight brokers for 20%,” he said. The brokerage market has softened a little, Transplace Executive Chairman Tom Sanderson said. What will happen with pricing in the rest of 2018 and 2019 depends on the economy. “In 2018, contract rates were up 6% to 9% and the sport market was up 25% to 30%. “In 2019, the spot can’t go up another 25% to 30%,” he said, adding that he expects it will increase in the 5% to 10% range. Armstrong said the gross profit on intermodal brokerage can be high, but those involved have to be good at what they do. 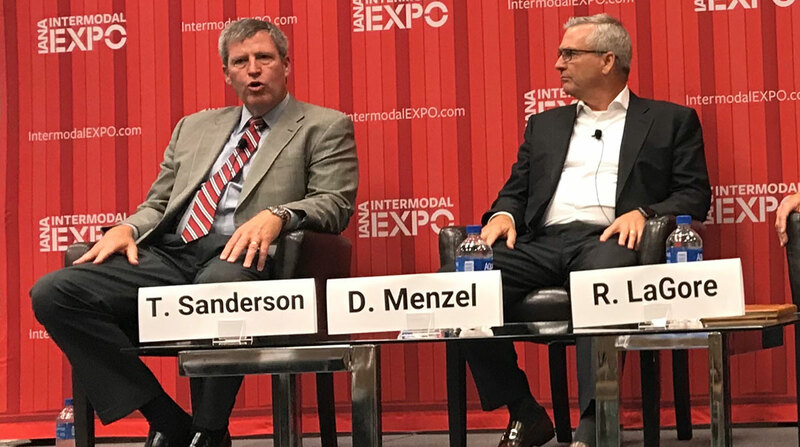 He foresees those that are adopters of artificial intelligence to be the winners within intermodal brokerage and expects to see increased automation when companies have lane and carrier history. However, human assistance is likely needed within the intermodal space due to its complexity.